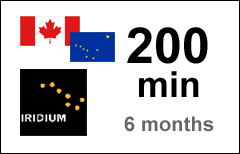 The Northern Lights 200-min voucher refills your existing and un-expired Iridium Northern Lights account with Sattrans. Maximum Account Validity. The maximum validity of a Northern Lights account cannot exceed 6 months from the date of the most recent voucher reload. Maximum Age Limit. The Maximum Age Limit of the minutes in a NL-200 voucher is 3 years.